키루나에서 오로라 보기에 실패한 나는 좀 더 북쪽으로 올라가기로 했다. 딱히 정해둔 목적지는 없고 그냥 지난 번에 벨기에 친구들이 아비스코가 죽여주더라 했기에 거기나 가 볼까 했다. 아비스코로 떠나는 기차는 아침 10시 44분에 오기로 돼 있었다. 황량항 기차역에는 나 말고도 자연산 곱슬머리 독일 청년과 박정호 닮은 독일 청년, 그리고 썰매에 의지해서 서 계신 스웨덴 할머니 한 분이 계셨다. 기다려도 기차가 오지 않자 그 할머니는 썰매를 타고 룰루랄라 도심으로 돌아가 버렸다. 다시 독일인 청년들이 묻는다. 기차는 12시 30분으로 미루어졌다고 한다. 시간을 칼 같이 지키는 스웨덴에서 이런 일은 처음 겪어본다. 잠깐 놀다가 다시 돌아왔는데 여전히 기차는 오지 않았다. 독일인 두 명은 아직도 거기서 기다리고 있었다. 관광 안내 센터에 갔더니 눈보라가 휘몰아쳐서 기차 길이 눈에 묻혀버렸다며 대신 버스가 1시에 올 것이라고 한다. 기차 대신 버스가 온다는 게 별로 실감은 안 났지만 기차역에 가 보니 진짜 임시 버스 한 대가 와 있다. 신기하게도. 타고 조금 가다 보니 버스 안에서 도시락을 나눠 주는데 나는 안 준다. 겉으로 말은 안 했지만 삐죽거리고 있었는데 도시락 나눠 주던 아저씨가 나에게 오더니 이건 스톡홀름에서부터 오는 손님들에게만 주는 것이라고 하며 미안하단다. 그제서야 마음이 평온해졌다. 참 별 것도 아닌데 말이지. 그렇게 도착한 아비스코는 이미 해가 뉘엿뉘엿 지고 있었다. 아니, 사실 이미 산에 해가 가려서 안 보였다. 숙소를 잡아야 하는데 황량한 눈밭에 나 혼자 뿐이다. 사람이 없으니 누구한테 물어볼 수도 없고 참 난감하다. 마침 어떤 주민이 마치 곰 사냥을 나가는 듯한 복장으로 집에서 걸어 나오길래 숙소를 물었더니 바로 여기라며 가르쳐준다. 아비스코 최고의 숙소라고 소개된 그 집에 들어가니 콧수염을 멋지게 기른 토마스가 밝은 표정으로 나를 맞는다. 카운터도 따로 없고 숙박비도 후불이고 사우나도 공짜고 스키도 공짜로 빌려준단다. 그것도 단돈 150kr에!! 인심 참 좋다. 시골이라 그런가? 아비스코의 기찻길. 철로가 가까스로 드러나 있다. 짐을 풀고 밖으로 나가 봐도 사람이 없다. 드문드문 지나가는 주민들은 오히려 내가 신기한지 힐끔힐끔 쳐다본다. 이 마을 전체 인구를 다 합해도 백명이 약간 넘는다던가? 슈퍼는 한 개, 식당은 있지만 가기 민망할 정도로 조용하다. 게다가 공중전화는 있는데 공중전화 카드를 파는 곳은 없다. 돈은 받지만 돈을 뽑을 곳은 없다. 기차역은 있지만 기차는 없다. 참 조용한 동네다. Failed to see Northern Light in Kiruna, I planed to go north more. 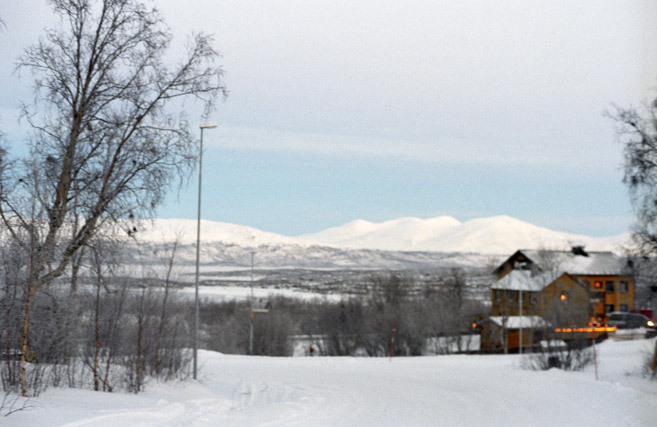 I didn’t have any special destination, just because Belgium friends told me that Abisko is really hot, I took it. The train was due to 10:44. In the desolated train station, there were three people more – a German with natural curled hair, another German looks like Mr. Park, a Swedish old lady standing against a sleigh – except me. A Swedish lady told me. Time passed, but the train didn’t come, the old lady came back to the city with a sleigh. German guys asked me again. The trains was delayed to 12:30. This kind of delay is the first experience in “punctual” Sweden. And even when I came back to the train station again, the train didn’t arrived. Two German guys still waited there. Asking to the information center, because of heavy snow, the railway is covered under the snow. Instead of the train an alternative bus will come. I couldn’t realize a bus can replace a train, but there was really a bus instead of train at the train staion, surprisingly. In the bus, a bus master distributed a lunch but not to me. I was disappointed with that – but without saying about it – he came to me and explained that the lunch is only for the customers from Stockholm. And I became relaxed. Just because of a small thing. When arrived at Abisko, I could see sunset. No, the sun was already behind the mountain. I had to find a hostel but there was nobody. Nobody to ask. Luckly, I could meet a resident with a bear-hunting-costume and he pointed a small house. Coming into the best hostel in Abisko, as the guide book explained, Thomas with nice mustache welcomed me with a bright smile. There was no counter, it was future payment, sauna was free, ski rental was also free. Just at 150 kr!!! Really kindheartedness. Because this is a small town? 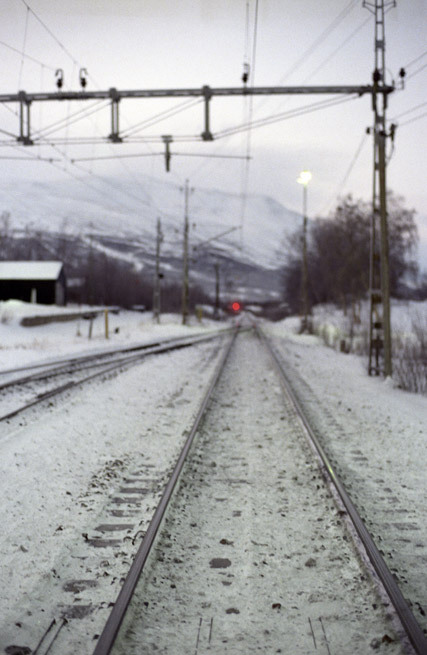 Railway in Abisko. The rail is almost coved by snow. Nobody in the town. Some rare dwellers glanced me with curious eyes. The guide book said there are only about 100 people live in this town. There are, only one supermarket, some restaurants with really quietness, some public phone booth but no phone card, money but no ATM, train station but no train. It was really really quiet town.